Pilgrimages and homages to the relics and holy sites have a long history and great significance in our tradition, as well as in the identity creation of the believers. Pilgrims do not aim, unlike tourists, to find something exotic, original, and unchanged; nor to consume some pseudo-spiritual places and events, or to catch an event more meaningful than a spiritual and Eucharistic life of their local church. The goal of pilgrimages is to seek God, renounce oneself and the imagined securities in life, in the presence of the most holy and sacred places, and other fellow pilgrims. This makes humility and repentance (change) main virtues of a pilgrim, as opposed to tourists who with a cosmopolitan (unchanged) gaze search for ‘authentic’ (unchanged) places that are also unaffected by the presence of other (tourists). In the period from May 25th to June 4th of this year, His Grace Bishop Longin of New Gracanica and Midwestern America, accompanied by V. Rev. 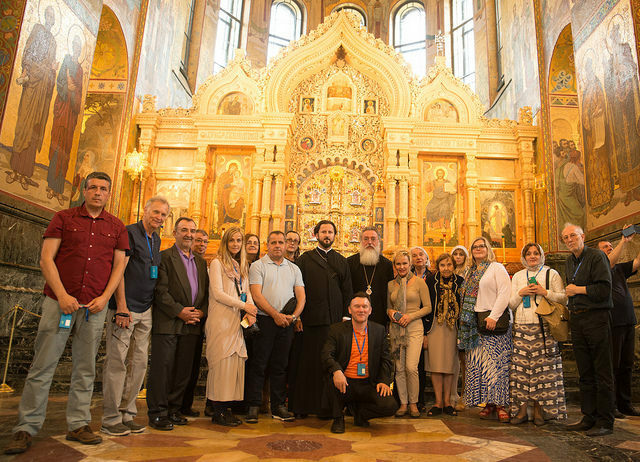 Darko Spasojevic, dean of Holy Resurrection Serbian Orthodox Cathedral in Chicago, led a larger group of the faithful to pay homage to the holy sites in Russia on a pilgrimage that left no one feeling indifferent. Most of the pilgrims were from Chicago and the surrounding areas, and a few were from other parts of America, Canada, and even Serbia. Everyone met together in St. Petersburg. The first deep impression that Russia leaves on its visitors are the enormous areas and distances of the nation, given that Russia with 17,000,000 (seventeen million) square kilometers, is the biggest country in the world by area, and that it covers 11 different time zones. 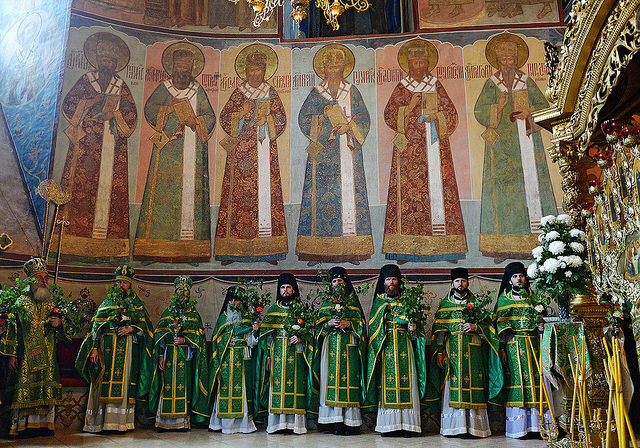 The same deep impression applies to the Russian Orthodox Church whose adherents number 150,000,000 (one hundred and fifty million) faithful worldwide. Equally great was the Russian hospitality and love of the Serbian people. 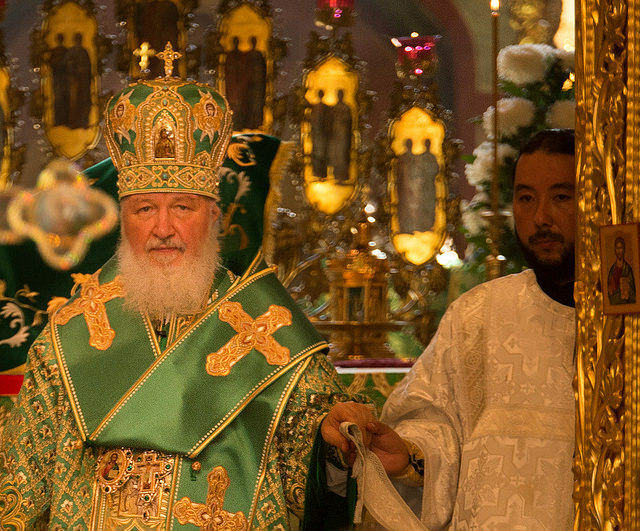 The kindness and love towards our group was highlighted at every step because of their general respect for Serbian people, and a particular esteem for Bishop Longin, who has a long relationship with the Russian Orthodox Church, from the time of attending the Moscow Theological Academy to receiving the Order of the Russian Orthodox Church bestowed upon him by Patriarch Kirill of Moscow and All Russia. In Saint Petersburg, or as some call it ‘Venice of the North,’ the Russian window to the West, the city of magnificent beauty, which is like a museum in the open air, whose residents are proud of the city’s aristocratic spirit, we spent three days and visited many holy sights, including the Kazan Cathedral, St. Isaac’s Cathedral, Cathedral of the Savior on the Spilled Blood, Smolensky Cemetery, as well as the Hermitage Museum, and other holy places and cultural sights. 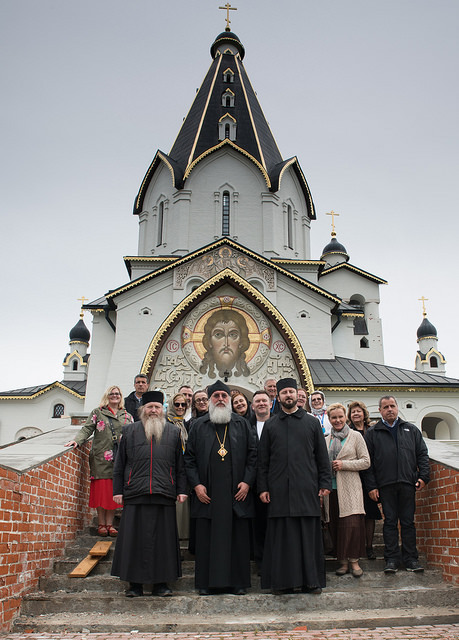 After St. Petersburg, the group went to the monastery of Valaam (in the area of Karelia), which is interwoven with Russian, Swedish, and Finnish history. During the day, accompanied by a monk and a local guide, we visited many sketes (monastic communities), and during lunch, at a reception specially prepared in honor of Bishop Longin at the central monastery of the Transfiguration of Our Lord, we had the honor of hearing a quartet of the famous Valaam Male Choir. Upon the return to St. Petersburg, we visited Tsarskoye Seloor Pushkin, a town named so because the famous Russian poet lived there for a period of time. The town was built on the land that Peter the Great in the beginning of 18th century gifted to his wife, Catherine the First. It is a former residence of the Russian emperors and contains magnificent palaces that today serve as museums surrounded with beautiful parks. The next morning, via fast train, we arrived to Moscow and then to the town of Sergiyev Posad, located about seventy kilometers northeast of Moscow, and to the Trinity-Sergius Lavra, the spiritual center of the Russian Orthodox Church, which was founded by one of Russia’s most celebrated saints, St. Sergius of Radonezh in the fourteenth century. 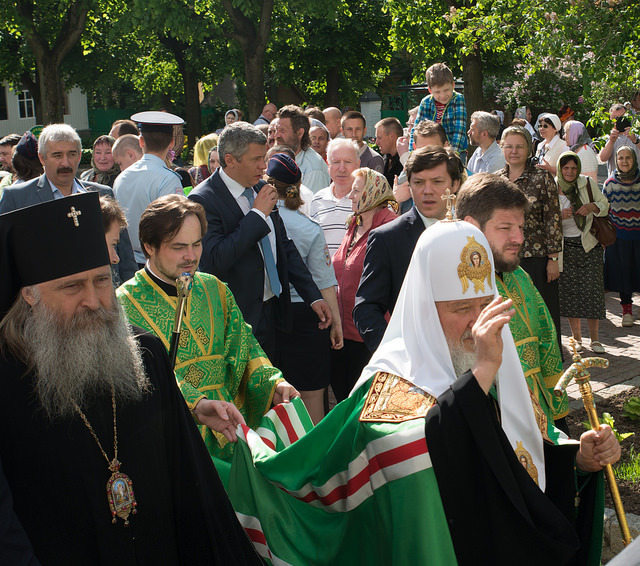 In the afternoon, the pilgrims visited many churches in the Lavra, venerated the relics of St. Sergius, and afterwards attended the festal vigil service on the eve of the Descent of the Holy Spirit on the Apostles. That same evening, Bishop Longin, accompanied by Fr. 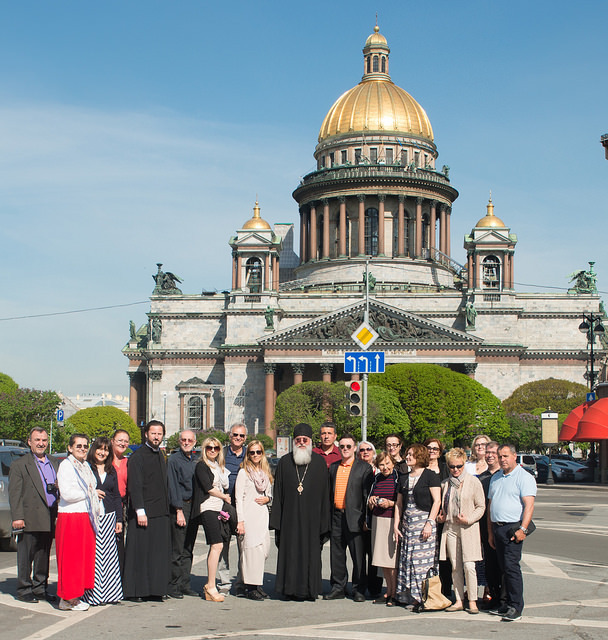 Darko, visited his alma mater, the Moscow Theological Academy, founded in 1685 in Moscow and moved to the Trinity-Sergius Lavra in 1814. 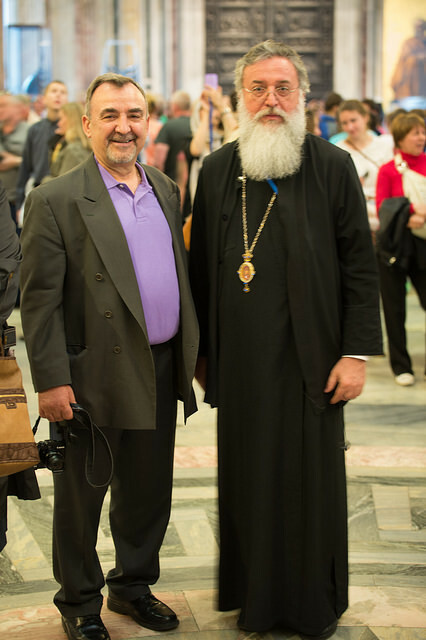 Bishop Longin attended a reception and dinner with Archbishop Evgeny, Rector of the Academy and Chairman of the Education Committee of the Russian Orthodox Church. 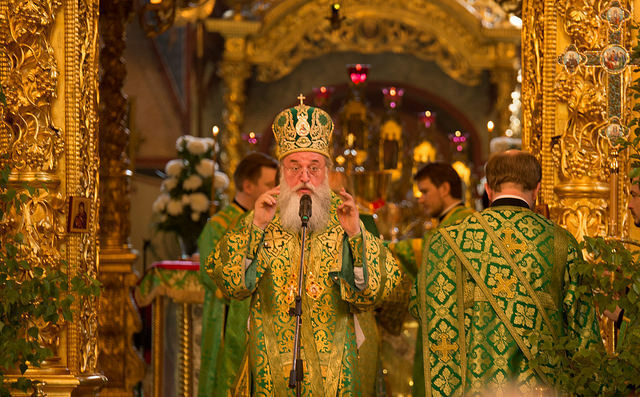 On the feast day of Pentecost, Bishop Longin concelebrated Divine Liturgy with Patriarch of Moscow and All Russia - Kirill, Archbishop Evgeny, and Archbishop of Sergiev-Trinity Lavra- Teognost, and other numerous priests. 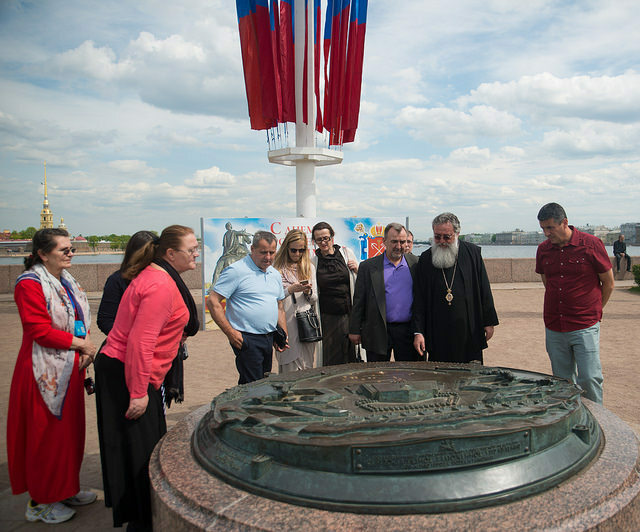 In the afternoon and the following day, we visited holy sites in the cities of Vladimir and Suzdal, and then headed to Moscow, where we spent the rest of the pilgrimage. In addition to the churches and attractions Kremlin, we visited the monastery of the Holy Virgin and venerated the relics of the Blessed Holy Matrona of Moscow, as well as the famous Tretyakov Gallery with the famous icon of the Holy Trinity by Andrei Rublev, and the “Vladimi Icon of the Most Holy Mother of God”, thus completing our pilgrimage. Here we only mentioned some of the places that we had the opportunity to see and visit. 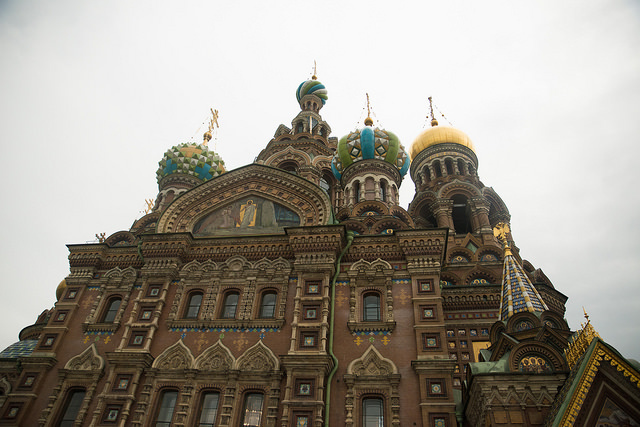 It is interesting to note that in Moscow, according to the local guide, in the Soviet period and all up until 1985, there were only thirty-five active churches, and today there are more than a thousand. There is a plan to build two hundred more churches. 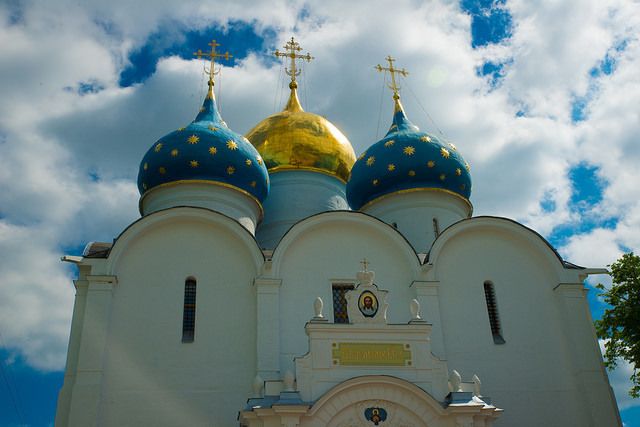 Because of its numerical strength in many areas and the vast natural and cultural resources, Russia is one of the travel destinations in which one always finds something new to see and visit. 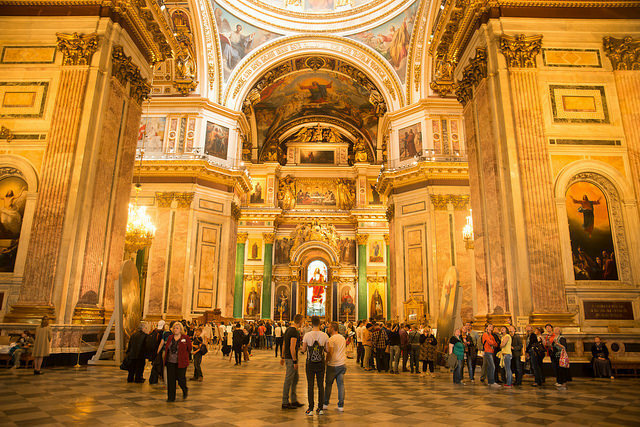 Historical narratives and words often tend to be abstract, but the lived experience, physical presence, and contact with the holy sites, leaves a deep and lasting impressions in our minds and hearts. This pilgrimage has left a deep mark on all pilgrims, who returned home with great spiritual joy and a new experience that they can now share with their families and friends, and thus add to it a missionary dimension and wider spiritual gain.